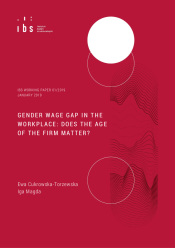 The newest version of the paper "Gender wage gap in the workplace: Does the age of the firm matter?" is published in European Journal of Industrial Relations. We contribute to the literature on firm-level determinants of gender wage inequalities by studying the link between a firm’s age and the size of its gender pay gap. Using European Structure of Earnings data for eight European countries, we find that in all of these countries, the gender wage gaps are smallest in the youngest firms. Our results also show that in Central European countries, the size of the gender pay gap clearly increases with the age of the company; whereas there is no such link in the older EU member states. Levels of gender wage inequality appear to be highest in companies that were previously state-owned, but were privatized during the transition. We interpret our findings with the support of competition and monopsony theories. additional information: This work was supported by the Narodowe Centrum Nauki (National Science Centre, Poland), grant number 2013/10/E/HS4/00445. Ewa Cukrowska-Torzewska gratefully acknowledges the support of the Fundacja na rzecz Nauki Polskiej (FNP, Foundation for Polish Science). We thank the participants of the 2017 GESIS conference, the 2017 WIEM conference and the 2017 IBS Jobs conference for useful comments and remarks. We are also grateful to the anonymous reviewers and the editor for all their advice and suggestions. This paper uses Eurostat data. Eurostat has no responsibility for the results and the conclusions, which are those of the authors. The newest version of the paper is published in European Journal of Industrial Relations.